in our hurry up, electronic, screen based society. “Smiles are such an amazing, wonderful thing. It doesn’t cost anything, you never run out of them when giving them away and you never tire of receiving them. If you give one away you are not more poor. Yet if you get a smile you are somehow richer, boosting you up and filling you with happiness. A smile only takes a minute, but the memory of that smile may last a lifetime. The amazing thing about smiles is that when you give one away, it somehow makes you feel just as happy as the person you gave it to. A smile tells someone that you like them, that you are friends, it communicates good will and acceptance. A smile makes the home a happier place to be and business more pleasant. A simple smile cheers you up, pushes away sadness or fears, gives encouragement and makes pain and trouble a whole lot easier to deal with. You can not buy a smile or steal one. A smile has no value at all until it is given freely and lovingly away or until it is received. What an amazing, simple action. Yet it carries such a huge value! Why not give some smiles away today? Your happiness tank will be filled as you fill-up the tanks of those around you! It has been said that a smile is worth a THOUSAND words! Proverbs 17:22 (NIV) says: “A cheerful heart is good medicine, but a crushed spirit dries up the bones.” A smile is like good medicine. It makes us cheerful. Even if you don’t really “feel” like smiling, if you try it for awhile, most of the time, you begin to feel happier as a result. It will make people wonder what you have been up to. Gather up crayons, colored pencils, stencils and paper; and, organize a family event. 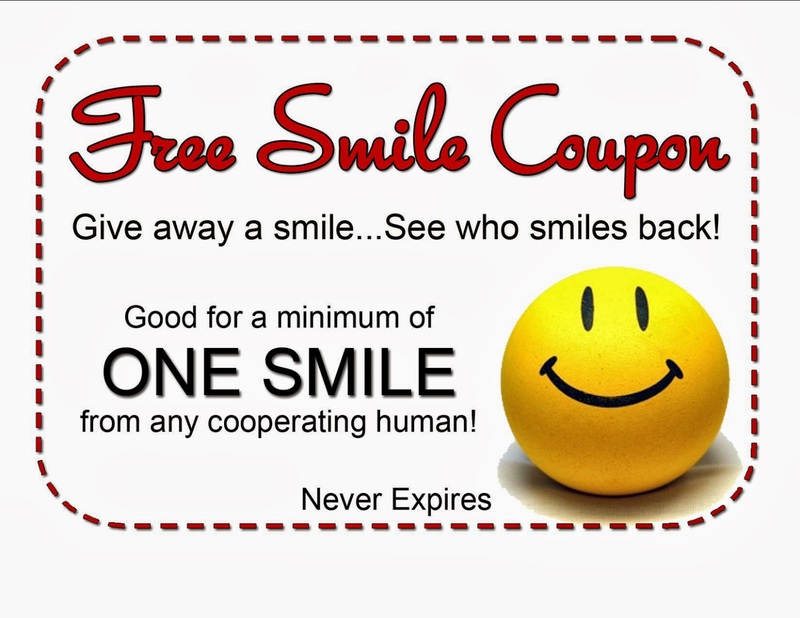 Have everyone create their own personalized smile coupons.